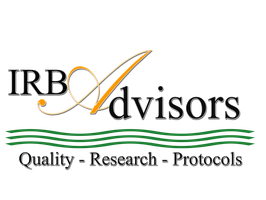 Welcome to Consulting Corner - IRB Advisors, Inc.
IRB Advisors, Inc. is pleased to offer personalized consulting services. Our expert consultants have conducted research, developed human research protection programs, provided directors of Institutional Review Boards, developed and provided highly specialized human research training including, targeted workshops, research education services and programs for many private and public institutions. Contact us today for a quote. IRB Advisors, Inc. is your resource for expert consultation on all aspects of Human Research Protection Programs (HRPP) operations. Our consultants are available to perform routine IRB audits as part of our quality assessment/quality improvement program. We provide expert crisis management of regulatory and compliance issues. Our team can assess the magnitude of risk involved, including reputation and public relations concerns, and provide guidance on appropriate actions. We have extensive expertise collaborating with legal representation while preserving attorney-client privilege, and preparing reports to assist with reporting to regulatory agencies as appropriate. We can offer extensive expertise managing outsourcing of IRB services. We assist institutions with evaluation of their resources and capabilities to determine how to best provide high quality and timely IRB review services. Evaluation of the mission of the organization, research community and stakeholders served by the research services function are all considered in order to determine how the organization develops and implement their research infrastructure. We can assist with IRB member and staff recruitment, training and development and much more. The structure of a Human Research Protection Program often needs to be developed to reflect and account for the volume of research being conducted and the expertise and credentials of the personnel available. In addition, potential conflicts of interest can develop within the regulatory administrative oversight function as responsibilities shift within the organization. IRB Advisors Inc. can recommend a structure that is specific to the needs of the organization or evaluate the present reporting structure and recommend the optimal staff alignment for efficiency, quality, and risk management. A well-developed human research protection program can offer protections to research participants while also protecting an institution. Our talented consultants have developed and managed human research protection programs with specific emphasis on the application of the federal regulations for the protection of human subjects. We can assist with design, development and implementation of processes, policies and procedures, website content, training materials and more.